Hanoi is a great land for those who want to discover Vietnamese food. Below are the top ten dishes that tourists should try when they come to the city. Throughout the country, you can easily find yourselves a hot bowl of pho. Yet if you are a food expert or you are acquainted with the taste of Hanoi pho, you will find that there is no pho that can have the flavor of the one served in Hanoi. The light sweetness of the hot broth which floods the white rice noodles having particular flavors of Hanoi will bring you the most satisfying feeling. Pho is a Vietnamese noodle soup, usually served with beef or chicken. The soup consists of noodles made from rice flour. This dish is often served with Asian basil, saw tooth herb, rau om (rice paddy herb), cilantro, thinly sliced green onion, lime juice, and bean sprouts that are added to the soup by the person who is dining. The dish is associated with the city of Hanoi in which the first Pho restaurant opened in the 1920s. Pho is a popular street food, and night-food. Alongside gỏi cuốn, “Pho” is one of “the world’s 50 most delicious foods,” according to CNN. There are a large number of famous pho restaurants in Hanoi, such as Pho Co Cu on Lieu Giai Road, Thin restaurant on Lo Duc Street, Suong restaurant on Dinh Liet Street, etc. The price for a bowl of pho is from VND25,000 ($1.2). 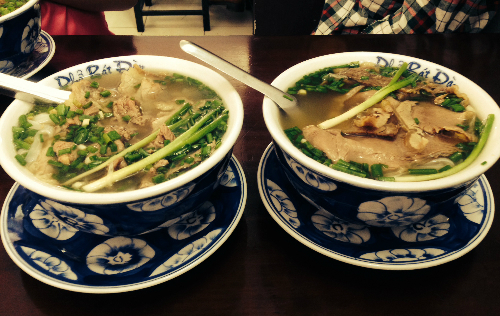 One of the favorite foods in Hanoi is pho tron. This dish is popular and delicious. 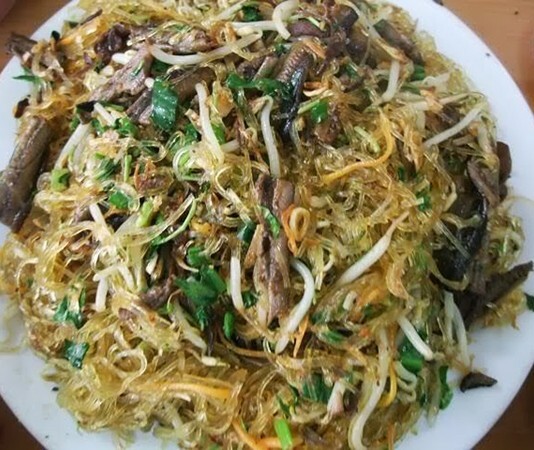 It’s a dry type noodles dish that includes dried beef, bean sprouts, dried onion and other raw vegetables; served in sour and sweet sauce made from fish sauce. The noodles are added into the bowl and then some pork chop, herbs, peanuts and dried scallions. Next, the cooks will add sour sauce,the most important ingredient to make this dish delicious. Each shop has a different way of making this sauce and they keep it as a secret. Therefore, you may enjoy different tastes in different restaurants. Bun cha is the signature dish of Hanoi. At lunchtime you’ll find just about all of Hanoi sitting on kid-sized stools and slurping down this combination of grilled pork, salty-sweet broth, slices of green papaya, rice noodles, and fresh herbs. Every neighborhood in Hanoi has a bun cha place — just follow your nose to the smoky street-side grill. Where to try: The ideal place to enjoy the specialty is the old-established restaurant at No.1, Hang Manh Street, Old Quarter Hanoi. But you can’t walk far without stumbling on bun cha anywhere in Hanoi. 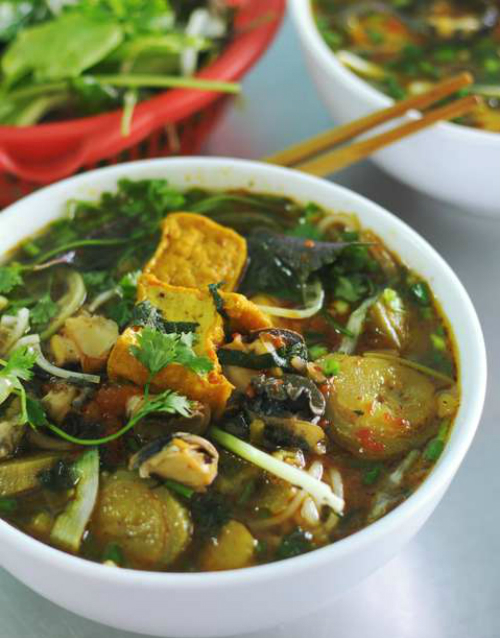 A Hanoi dish that makes people want to try immediately only by hearing its name. For a long time, bun dau mam tom has become a specialty that many people have to try whenever setting feet on the capital city. 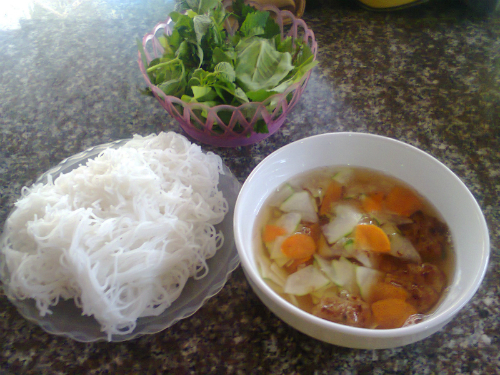 A set of bun dau mam tom includes a dish of fresh rice vermicelli, fried tofu, shrimp paste mixed with lemon or kumquat juice, raw vegetables, and boiled pork. Some restaurants even add fried fish paste to the set. It will be a big mistake if visitors to Hanoi skip bun dau mam tom. Apart from the renowned Hanoi pho noodle, pho cuon is not less delicious and its genuine taste can only be found in Hanoi. 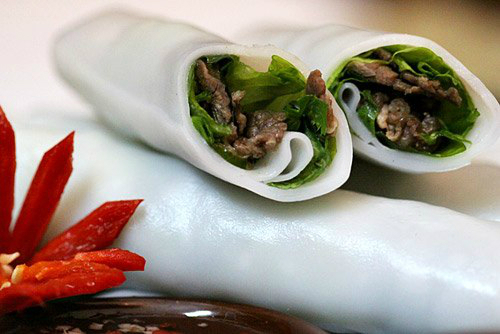 Fried beef and herbs are rolled in the rice paper cake and then the roll is dipped into a sour and sweet sauce which is added with slices of pickle. To enjoy this dish, tourists should visit the restaurants on Ngu Xa or Quan Thanh Street. Being one of the most famous dishes of Hanoi, bun oc can satisfy people of all ages. The dish, however, is very simple, containing only rice vermicelli, several snails, sour broth and herbs. 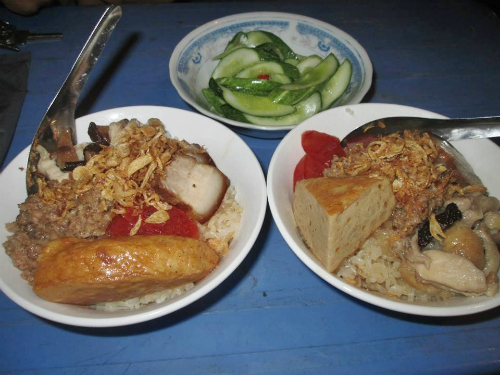 Bun thang or rice vermicelli with chicken, egg and pork can be enjoyed at any time of the day. The clear yet flavorful broth is made with 20 ingredients, including dried shrimp, squid, shrimp paste, spring onion, coriander, ginger, mushroom, beet, fish sauce, sugar candy, and vinegar. It is also a particularly attractive Hanoi dish as the noodles, chicken, eggs, pork slices, and a dollop of shrimp paste are carefully arranged to resemble a flower. Bun thang is one of the most popular yet hidden fares in Hanoi and one can find it only outside of the Old Quarters or a few special restaurants scattered across the city. The chicken broth is artistically done and the dish is beautifully served. 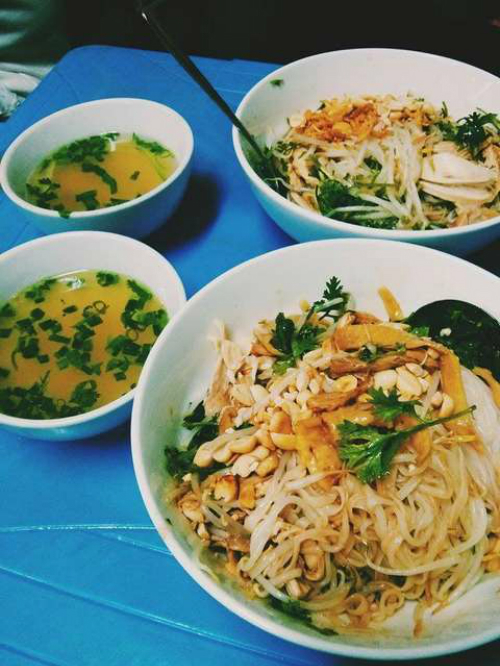 Where to try: Bun thang Ba Duc on Cau Go street or Bun Thang at 13 Gia Ngu is a great place to try the dish. This street vendor has a limited number of seats on the pavement but you will be surprised how many people can fit in the two storey old house behind the stall. There are lots of dishes processed from duck meat, for example duck simmered with dracontomelum, sauté duck, duck with bamboo shoot, etc. 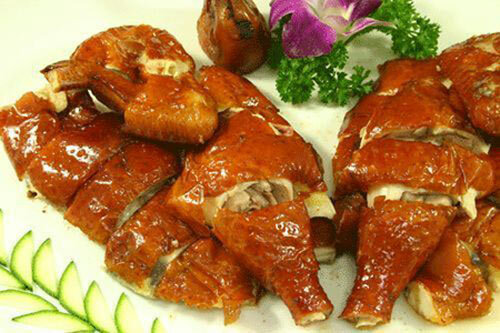 You can enjoy these at duck meat restaurants on Kim Ma or Lang roads. Chances are you will encounter this dish in almost every outdoor market. There are even two restaurants dedicated fully to this dish in the Old Quarters. Xoi xeo is sticky rice topped with ground de-hulled mung bean and fried onion. Sometimes it can be served with eggs or steamed chicken breast on request. The serving is filling and is good for any time of the day but most Vietnamese have it for breakfast or lunch. Hanoi’s oc luoc is special for its sauce. Some boiled snail restaurants are well-known for their sauces, which have special flavors. Boiled snails are taken with minced ginger, lemon leaves and sometimes with cucumber and pachyrrhizus. 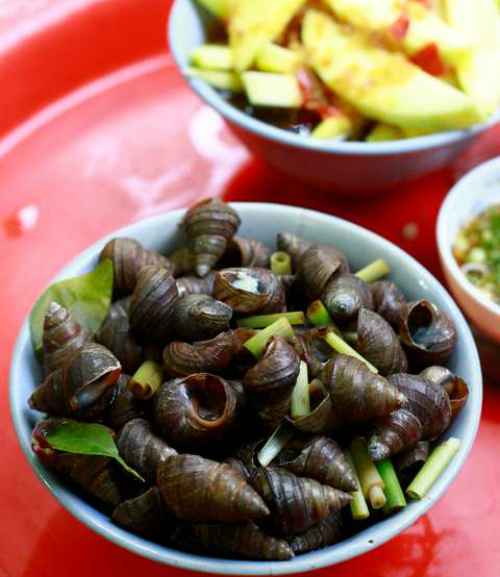 To enjoy the best boiled snails, visitors should go to a boiled snail restaurant on Luong Dinh Cua Street, No. 1 Dinh Liet, Lan Binh restaurant at 18 Hang Ba and Trai Gang market. This cuisine is usually available from late afternoon to midnight. 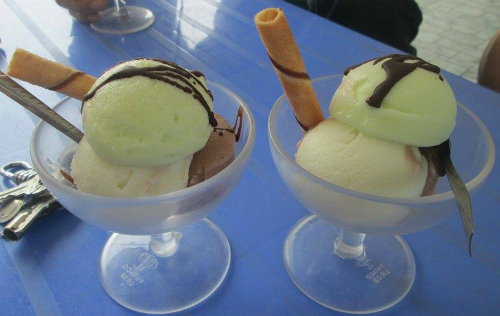 The ice cream shop which was established in the subsidized period has become a symbol of Hanoi. Situated on Trang Tien Street, Hanoi’s center, the shop is crowded all the time, even on winter days. This is a folk cuisine of Vietnam which is processed from steamed pig ears. They are sliced and mixed with roasted rice powder. 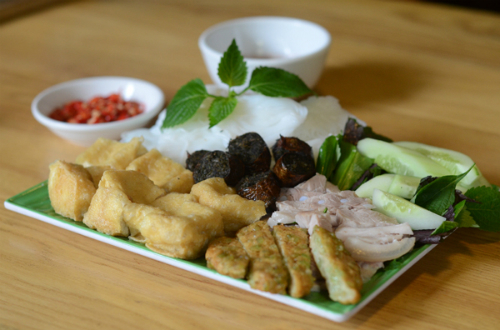 Nem tai is accompanied with girdle cakes, fig leaves and salted fig, raw vegetables and sweet and sour sauce. Visitors should enjoy this cuisine at Ms. Hong’s nem tai restaurant at No. 35 Hang Thung Street. This is a special cuisine of Hanoi. 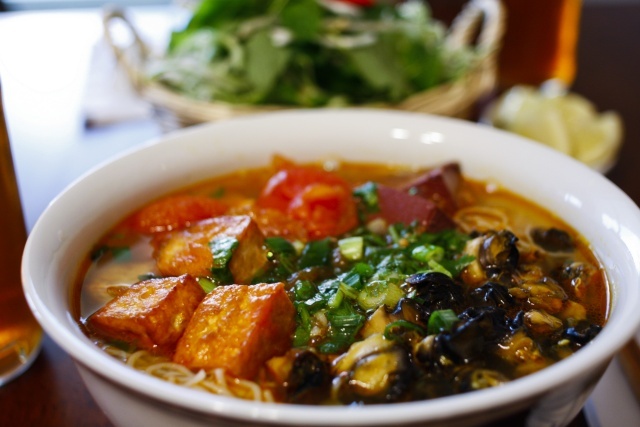 Anyone who once lived in Hanoi cannot forget this cuisine, which has nourishing flavor of thickened vinegar, moreish and brittle snails, dried tofu, raw vegetables, etc. Although it is quite easy to cook, it needs secrets to have a delicious bowl of bun oc. You can enjoy this cuisine at Ms. Sau’ bun oc restaurant at 73A Mai Hac De or Ms Luong’s bun oc restaurant in Khuong Thuong Street or Co Beo restaurant at No. 1 Hoe Nhai or at Nguyen Cao market, No. 5 Dong Mac, Hai Ba Trung district. A bowl of bun oc is only VND20,000 ($1). A distinctive Hanoi delicacy, Cha ca is made from mud-fish, snake-headed fish, but the best fish is Hemibagrus (Ca lang). Fish bone is taken out to keep fish meat only, then seasoned with pieces of bamboo, and fried by coal heat. An oven of coal heat is needed when serving to keep Cha ca always hot. Cha ca is served with roasted peanuts, dry pancakes, soft noodle soup, spice vegetables and shrimp paste with lemon and chilli. Cha ca is so popular amongst locals that there’s a street in Hanoi Old Quarter named after it. The Cha ca La Vong Restaurant on No.14 Cha Ca Street is the “ancestor restaurant” of the dish. The main materials to process this cuisine consist of green papaya, dried beef, raw vegetables and sweet and sour fish sauce. Nom bo kho is sold everywhere, but to enjoy the best Nom bo kho, tourists should visit the Hue nom restaurant on Ham Long Street and Long Vi On restaurant at No. 23 Ho Hoan Kiem Street. The price for a dish of nom bo kho is from VND20,000 ($1). A popular street food of Hanoi which is favored by many people. It is not difficult for you to find a bistro or restaurant selling banh da cua at a reasonable cost. It is a delicious dish with many positive points as it is easy to taste and it neither makes your stomach heavy nor causes you to get tired of eating the food. 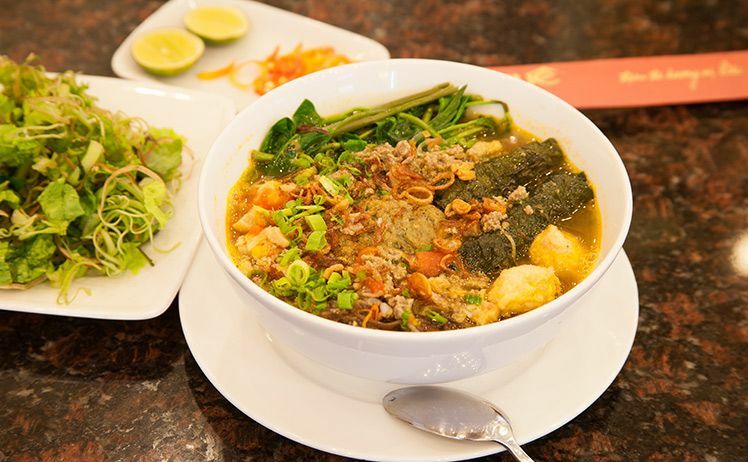 The crab noodle soup is normally served with cha lua (Vietnam’s pork sausage), boiled water spinach, bean sprouts, mingled in the mouthwatering aroma of fried shallots and the greasy taste of roasted peanuts. 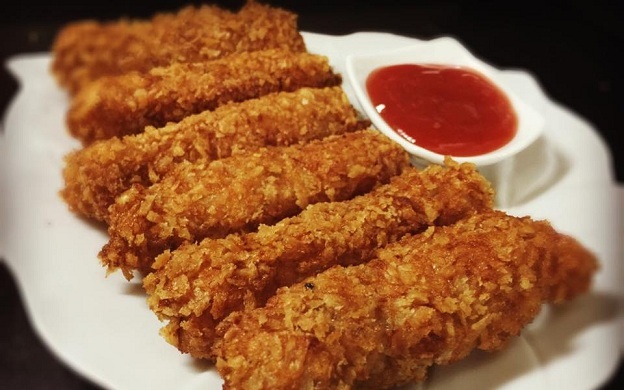 Although considered a snack, nem chua is indeed the one-and-only specialty of Hanoi. 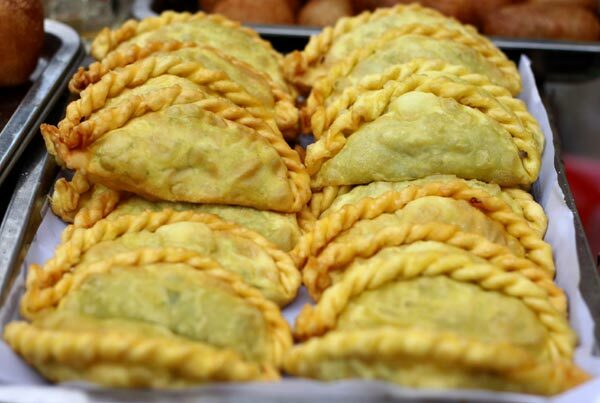 If the grilled one has an eye-catching yellow color along with a delicious greasy taste, the fried one has a pink color and brings diners wonderful flavors created from a combination of pork meat and pigskin. The two dishes can be found at many restaurants but it is recommended that you should come to the bistro at 36 Tam Thuong Street, Hang Gai Ward, Hoan Kiem District to taste the best fried fermented pork of Hanoi and visit the restaurant at 10 Au Trieu Street in Hoan Kiem District to have the most tasty grilled fermented pork of the capital city. 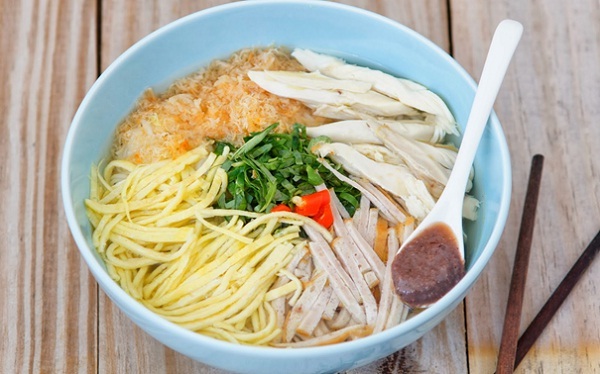 Appearing in the capital city for several years now, the mixed tofu sweet soup has quickly become a favorite snack to reduce the heat in hot days for young people in Hanoi. 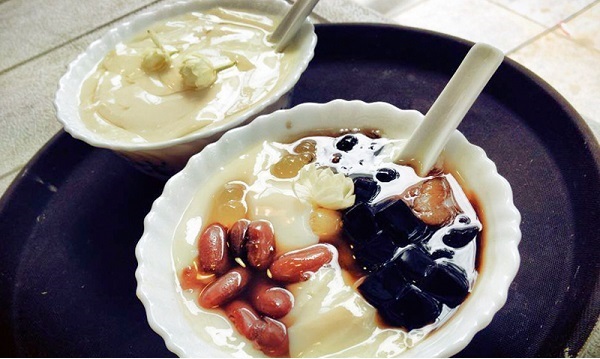 Normally, a bowl of mixed tofu sweet soup includes lotus seed, red bean, jelly, and dried copra. All of those ingredients will then be flooded with the syrup with fragrance of jasmine and coconut milk. Coffee was introduced into Vietnam by French colonists in the late 19th century. Vietnam quickly became a strong exporter of coffee with many plantations in the central highlands. The beverage was adopted with regional variations. Because of limitations on the availability of fresh milk, the French and Vietnamese began to use sweetened condensed milk with a dark roast coffee. Today, Hanoians like to drink coffee in the morning time. In fact, sitting on small chair on pavement with a glass of coffee became the popular image of a Hanoian. Travellers who visit Hanoi also like trying delicious flavours like Hanoians andrecognize that nothing is better than a cup of coffee at a modern or luxury or pavement cafe to soak up the rhythms of the street and embrace Hanoi from all of its sides, from old to new, from traditional to modern & quirky. 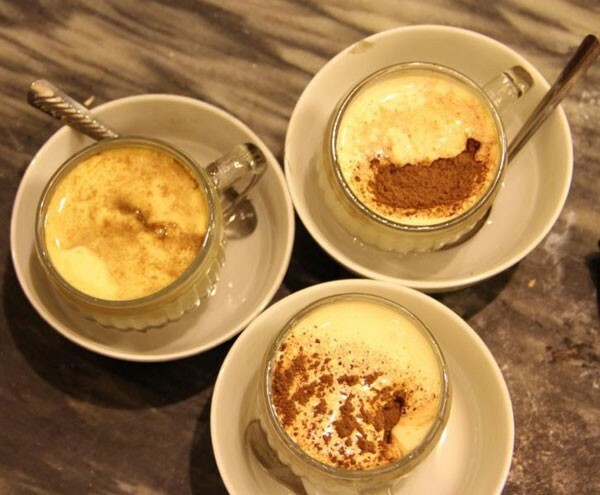 Besides a cup of coffee with sweet milk and/or a spoonful of sugar, Hanoians create new ways to enjoy coffee in Hanoi – ca phe trung (egg coffee) and ca phe sua chua (yogurt coffee). Where to try: Lam (60, 91 Nguyen Huu Huan – known as one of the oldest coffee shops in Hanoi), Nhi (2 Hang Ca), Nhan (39D1 Hang Hanh), Nang (6 Hang Bac), Quat (Quan Thanh), Quynh (Bat Dan) to Giang (Hang Gai) and Ca Phe Pho Co (11 ward – Hang Gai street). The last two, Giang and Ca Phe Pho Co, are recommended for egg coffee. 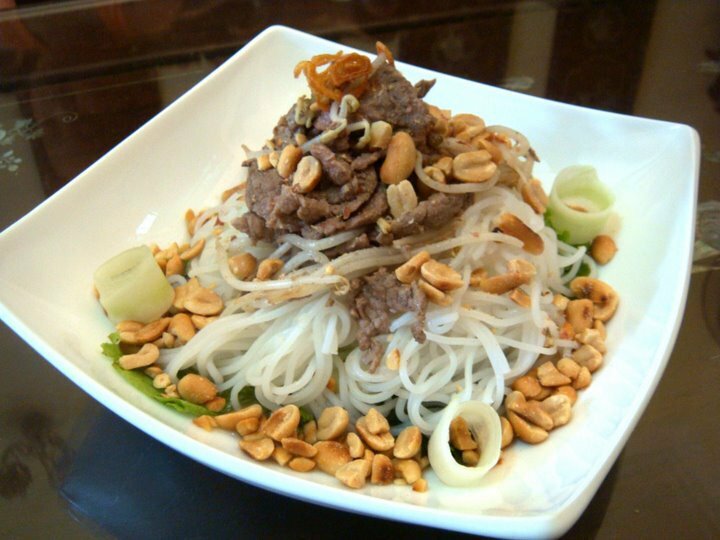 It is an interesting kind of traditional Vietnamese food made from beef and herb: a bed of rice noodles is topped with tender grilled beef, chopped cucumbers, lettuce, papaya slivers, fresh herbs, crushed peanuts and heaps of crunchy fried onions. Mix it with fish sauce–spiked nuoc cham, take a bite, moan and repeat. If the French have their famous crepe made of wheat, egg and dairy products; Vietnamese and particularly Hanoians are proud of their steamed crepes from rice flour and water. Great as a light breakfast or midday snack, banh cuon is a combination of ground meat (chicken, shrimp, or pork), minced wood ear mushroom, onions, Vietnamese ham (cha lua), steamed beansprouts, and cucumbers wrapped in a steamed rice flour sheet. Its overall taste is very mild despite the savoury ingredients, and you can also dip the banh cuon into nuoc cham sauce for added flavour. You can easily spot roadside vendors selling banh cuon all over Hanoi, but Banh Cuon Gia Truyen in Old Quarter is a good alternative as the restaurant provides menus with English translations. Where to try: Banh cuon Gia An – Ba Trieu street has more upscale restaurants specializing in Banh Cuon. The price is not thatdifferent compared with other street vendors. 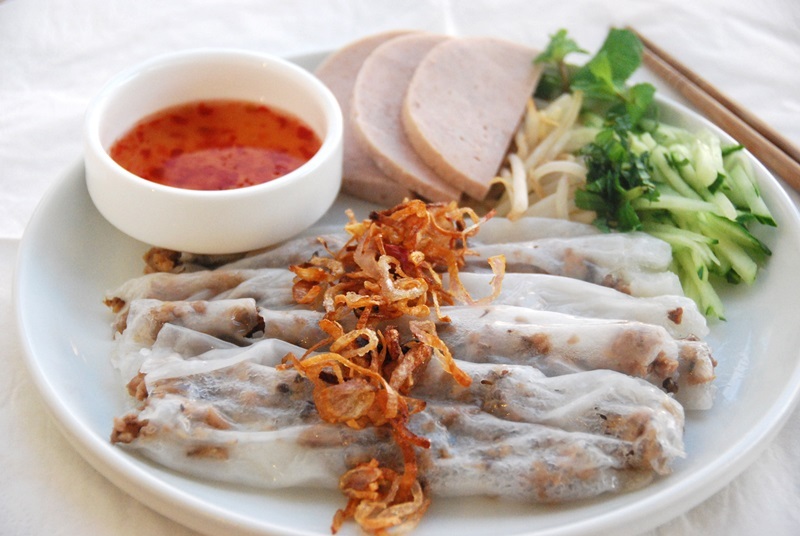 Banh cuon there is made without preservative and of high hygiene condition. You can ask for a vegetarian option as well. Mien xao luon is another tasty option for seafood lovers, comprising stir-fried glass noodles in an eel-based broth with generous toppings of crunchy eels, bean sprouts, egg, cucumber slices, fried shallots, and purple perilla. 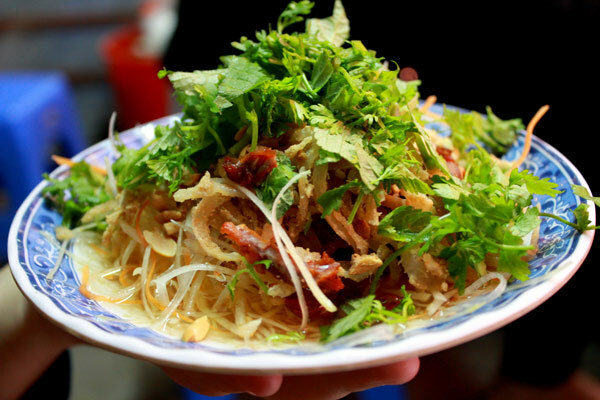 As with many dishes in Hanoi, a side of fresh herbs, shaved banana blossoms, and bean sprouts are served on the side. Dong Thinh Nha Hang Mien Luon at Hoan Kiem District is a local hangout spot for mien xao luon, where dishes are priced between VND 35,000 and VND 50,000. Shaped like miniature pillows (hence the name), banh goi contains finely-chopped glass noodles, wood ear mushrooms, minced pork, steamed quail eggs, and seasoning within a rice-flour pastry. It is then deep-fried for a crispy texture and served with a sweet-sour dipping sauce made with garlic, chilli, sugar, lime juice, and fish sauce. You can also pair your banh goi with fresh lettuce and coriander leaves if you find it too greasy to enjoy it on its own. 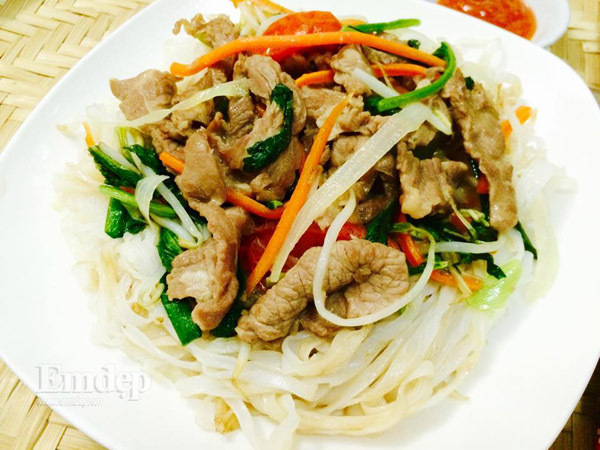 Pho may be best known as rice noodles served in soup, but you can also enjoy it in the form of pho xao, which is stir-fried with onions, beef slices, and assorted greens. The flat pho noodles are usually crisp on the outside with a smooth glutinous texture, and most restaurants sometimes add fried eggs and chilli sauce to this simple yet satisfying dish. Thin is a family-run restaurant within Hai Ba Trung District, where you can savour pho xao for only VND 50,000.